The Swiss luxury watch brand Ulysse Nardin, famed for its vast array of beautifully designed watches, has released another addition to its ever increasing line. 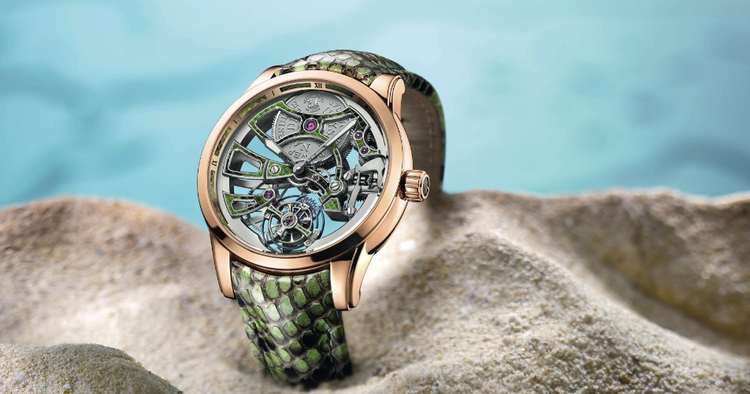 Their latest release is the Royal Python Skeleton Tourbillion Manufacture. It is an absolutely stunning work of art, just begging to adorn your wrist. Extremely limited with only 18 to be manufactured, its appearance matches its namesake, with its Snakeskin inspired form, from its standout Python strap to the colour choices on the face itself with a dash of green mixed with the silver mechanics. The contrasting bezel is in sublime 18 carat rose gold that completes the design. 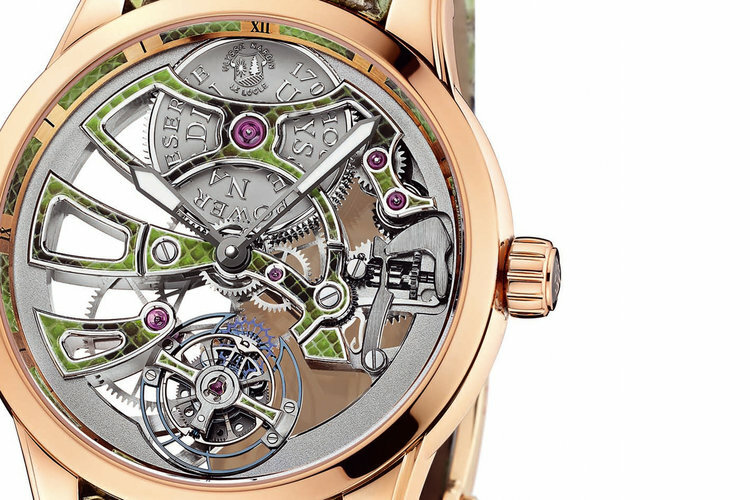 As with all skeleton time pieces, the main attraction is allowing the inner workings to be displayed for all to see, allowing natural light to pass effortlessly through the mechanics creating a gorgeous glow of luminosity, not to mention showcasing the perfect hand painted movement bridges its smattering of rubies. Its fantastic aesthetic appeal would be left lackluster were it not to have the expertly crafted movement to back it up. Beneath the face is the UN-170 Caliber, enabling the watch to have 170 hours of undisturbed power. This manual winding watch features silicium technology with escapement wheel with a balance spring and anchor to provide expert time keeping, all housed inside a generous 44mm casing. The watch brand Ulysee Nardin is an expert in its craft, founded in 1846 and creating expert timepieces ever since. Owning one of their watches is a joy to behold and this Python Tourbillion would be the perfect way to introduce yourself to the brand. 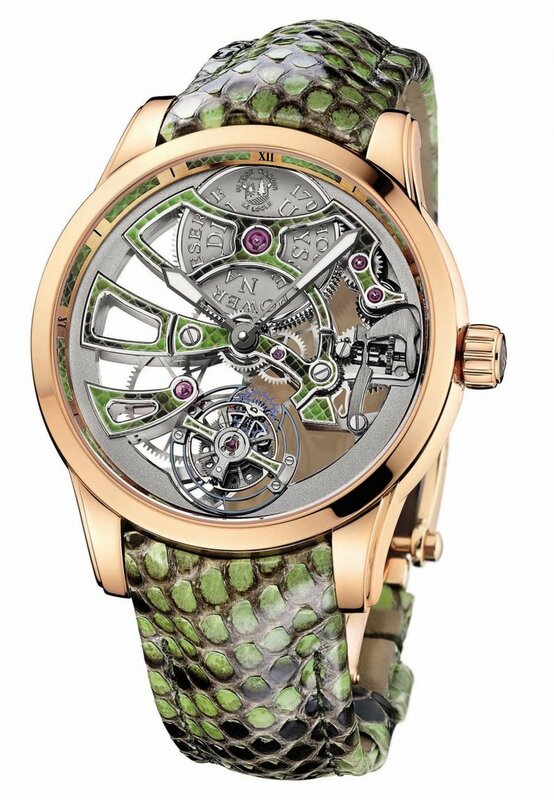 But with an astronomical price tag and scarcity, this reptilian watch will be obtainable for the very few. Guys, let us here at Fashion Runway Blog know what you think.